In a rundown commercial building in Charlestown, 12 men and women are trapped in a room, trying desperately to evade the clutches of a snarling, grasping zombie who is chained to a wall. They know the clues they need to unlock the door and escape are hidden in the room, so they’re flipping through books, scrutinizing postcards, and pulling entire drawers out of a dresser. But the pressure is on: Every five minutes the zombie’s chain extends another 12 inches with a mechanical clunk. By the end of the allotted hour, he will be able to reach everybody in the room. It’s all part of a peculiar live show with the straightfoward title “Trapped in a Room With a Zombie,” produced by the Chicago-based Bucket List Productions. 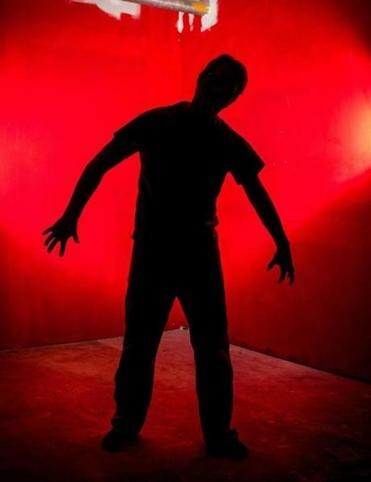 The zombie, played by an actor in makeup, scrubs, and a lab coat, doesn’t actually bite people, and if a group of participants is stumped, a silent guardian known as the “omnipotent” will use body language to slyly feed them hints. The performance draws inspiration from role-playing games, horror films, and particularly murder-mystery dinners, which similarly draw the audience into an active role in the narrative. “When you buy a ticket, you are an actor,” said Bucket List Productions CEO Marty Parker, who wrote the script for the room. Parker, who studied theater at Ohio University and at one time worked as the mascot for baseball’s San Francisco Giants, was inspired by similar “escape the room” shows he saw in Asia and Europe. In designing the show, he says, he took that formula and introduced the zombie as an antagonist, to give the experience a physical component and to keep participants on their toes. “Soon enough, someone realizes that zombies are attracted to noise,” Parker said. “And someone starts clapping, distracting the zombie.” Parker has also been involved for years in geocaching, a community of enthusiasts who hide parcels in public places and post clues and puzzles online for would-be treasure hunters. That experience, he said, informed puzzles in the room, which are a mix of code breaking, symbolic reasoning, and plain old ransacking. About 30 percent of groups escape successfully, Parker said. The ones that do are those that learn to collaborate under pressure. “The teams that get out are the ones that communicate,” said Boston “Zombie” producer Michelle Sisco, who holds a law degree from Northeastern University. Sisco said that since the show opened in May, it’s attracted horror enthusiasts, puzzle-solving clubs, and even couples looking for an unusual first date. It’s also been popular with groups of co-workers — some even sent by their employers as a team-building exercise. The zombie and the guide are played by a rotating cast, mostly of college students, some of whom are enrolled in theater programs. Each performer brings a different set of traits to the part they play, says Sisco, who has at times played both the zombie and the omnipotent. Participants can be destructive. In an adjacent room are backup copies of most objects in the room for the times they are inevitably broken during the performance. But overall, Sisco says that she is constantly impressed by the initiative and creative thinking employed by participants. “There are as many ways to solve a problem as there are people,” she said. By the end of July, Bucket List Productions will have opened rooms in 11 cities. Parker is currently developing a sequel to the room, as well as themed rooms for specific cities. In Chicago, Parker said, the room may be mob-themed. For showgoers who are anxious that the performance might be too frightening, the whimsical approach may come as a relief. Those expecting a hard-core horror experience, though, might be in for a letdown. Most participants, though, seem to suspend their disbelief and become invested in the show. Back in the room with the zombie, progress is slow and the group is trapped against the back wall. “The chain is getting pretty long,” says a woman, apprehensively.